Look at the wonderful prizes set up for a special Dad to win. Listen to Stars 104.3 for more details and daily winners. Concert of Praise tonight (June 16) raises support for Lubbock Version of "EXTREME HOME MAKEOVER"
Levi Ministries has taken on the project of helping the Gloria Rodriguez family with their version of Extreme Home Makeover. Tonight's concert begins at 7:00 at Davis Park, 42nd & Nashville. Concert is free but an offering will be taken. Click here to see a video about the home makeover project and how you might want to help. 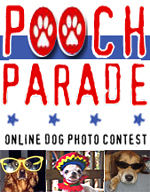 We'll have another Pooch Parade online again. That was fun! There were winners in four categories: Magnificent Mutt, Best Dressed, Owner Look alike, and Ugliest (so ugly they're cute.) Thank you, everyone, who helped us online and at the Pet Fair to select our winners. Click here to see who won. VIP Profile & Welcome New Folks! Whether you joined at the Pet Fair, at the Gatlin Brothers concert, online, or because a friend sent you ... here's what you do next. At the bottom of this email, there's a line that says "Update your personal settings". Click on that and update your profile. This is where you fill in your contact information and select the types of information you would like to receive. Do you like Estate Sales? Have children? Single? Want to know about Travel, etc.? Just tell us what you want and we'll be happy to get the information to you. While 100% private (guaranteed), filling in the different areas really helps us know you better. Thank you for doing that! Welcome aboard! Would you give me your "car" thoughts? * Do you drive a car you love? What kind is it? * Do you have a car/van/suv to sell? If so, email details. * Will you be buying a car in next 2 years? If so, why? * Do you have a car dealer or friend in the car business you would recommend? Thanks in advance for ANY answers you will provide! For more information on THESE EVENTS listed below ... visit the CALENDAR OF EVENTS and look up the event by DATE. For more details, contact the event directly. Events are subject to change. June 17 & 18 - "The Somewhat True Tale of Robin Hood"
June 19 - I'm Ducky for Dad Day ... at Texas Water Rampage! Take a look at the amazing and many other things going on! Visit Calendar of Events for details on these and many more! Visit How To U for more details on neat things you can learn! Visit Golf Events for tournaments and special offers! June 22 - Children's Theatre in the Park: "Once Upon A Time"
June 24, 25 & 26 - Critterfest! June 24-25 - A Cabaret called "Irving Berlin: All American"
June 25 - Storytime with "Buddy: The Story of Buddy Holly"
June 28 - "Water Works: Indoor/Outdoor Fountains"
Need a little inspiration? You can always look to Life Lessons to inspire or encourage or just entertain. This week ... it's about Dad! It's a great day in Lubbock! Then, again, it almost always is! If your mail or filter service is filtering out any photos or you want to read the postcard message direct, read our online version.